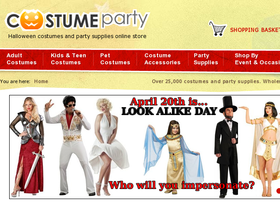 Costume Party, online at costumeparty.com, is your online theme party superstore. Costume Party is the place to shop for finding a great selection of costumes and party supplies. CostumeParty.com carries humorous costumes, historical costumes, pirates, queens, famous figures costumes, zombies, Spider Man, Star Trek, Star Wars, Christmas costumes, and so much more, including food and vegetable costumes. Not only does Costume Party offer adult costumes, Costume Party has a selection for kid costumes, dog costumes, costume accessories, face masks, and party supplies such as pinatas, candles and candle holders, invitations, plush toys, and more. CostumeParty.com is a great stop for Halloween, Christmas, birthdays, or any day you wish to throw a party. But before you shop, be sure to get all the latest CostumeParty.com discounts, Costume Party promotions, and Costume Party coupon codes found here at RetailSteal.com. CostumeParty.com ships within the Continental U.S. only. Shipping costs vary based on shipping method and items. See site for more information. Use this coupon code at Costume Party for 10% off your purchase. Click link to shop and save. Use this coupon code at Costume Party to save 5% on all products. Click here to get your costumes and party supplies. Take advantage of low $3.95 shipping on your purchase from Costume Party. Use coupon code on purchases $50+. Check out the Deal of the Day right now at Costume Party and save up to 55% or more on great party supplies or costumes. Click link to shop. Kid costumes start as low as $9 from Costume Party. Click here to shop today and save for Halloween, school plays, parties, and more. CostumeParty.com has a wide selection of TV and movie character costumes - starting at $10.50. Click here to shop. Shop for Star Trek costumes starting under $18 from Costume Party. Click here to shop and save. Use our coupon code online at Costume Party today to save 10% on all merchandise. Click the link to shop now.